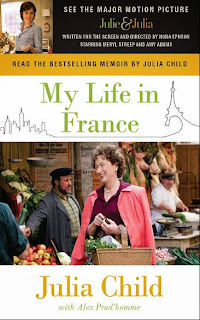 A while back, Duckworth Publishers, an independent publisher, kindly sent me a review copy of 'My Life in France', by Julia Child with Alex Prud'homme. With Christmas coming, it's just the sort of reading book that would be ideal for a foodie. I had been going to put it on my own Christmas list as an idea for one of my kids to buy for me. Most of us know Julia Child as the author of the book, 'Mastering the Art of French Cooking', but know very little of her difficult years to get that book published. 'My Life in France' takes us on a culinary journey, from Julia's arrival in Paris in 1948, where she could only muster up a few words of French and had no clue about cooking, to her last days where she recounted her life to her grandnephew, Alex Prud'homme in 2004. The book is bursting with Julia's adventures and her quest for culinary perfection. She shows unending determination to get her cookery book published in her homeland of America, while capturing the charm of post-war Paris long the way. We learn about her first meal in France, a sole meunière, to her gastronomic obsessions; we see her take her Cordon Bleu diploma and, with the aid of two friends, write her first cookery book. Julia's life was certainly an adventure, with ups and downs, frustration and stubbornness. She was one of those people that you either loved or loathed, and either way, 'My Life in France' is a compelling read. Throughout the book there are plenty of black and white photographs documenting her life from family snaps to pictures of her on the sets of her TV series. If you are looking for a stocking filler for Christmas, this book has it all! Sounds like a good one, should be a great read. I loved this book - I'm not usually one for autobiographies, but Julia is so full of life and funny to read that I couldn't put this down! I've been meaning to read this since the movie came out. Can't wait sounds like a terrific read! This book is definitely a great read - I hope you enjoyed reading it as much as I did. I bought this on my last trip to the US and just finished reading it. This is one of those books that you wish just went on forever. She inspires and makes you think that whatever you want to do you can with just a little gumption! Great great read!